Members of the public are invited to the annual general meeting (AGM) of local NHS leaders, NHS West Lancashire Clinical Commissioning Group (CCG). The event will be held on Tuesday 26 September 2017 at Parbold Village Hall from 11.30am (for registration) until 2.30pm and is a chance to learn more about the local NHS. This year’s event is being hosted alongside West Lancs CVS. Greg Mitten, chief officer of West Lancs CVS and lay member for patient and public participation at NHS West Lancashire CCG, said: “Bringing together both the AGM and our own health network event, is a fantastic opportunity for the community to hear about the work of our local NHS and understand the essential contribution that our voluntary and third sector make within West Lancashire”. Throughout the day, many community groups and organisations from the voluntary, community and faith sector will be hosting informative market stalls, where attendees will be able to pick up useful information and advice to help them. Refreshments will be provided on the day. It is therefore encouraged that places are booked in advance by contacting vicky@wlcvs.org or by calling 01695 733 737 advising of any special dietary, sensory and venue accessibility needs. The event is taking place in Parbold Village Hall, 2 The Green, Parbold, Lancashire, WN8 7DN. 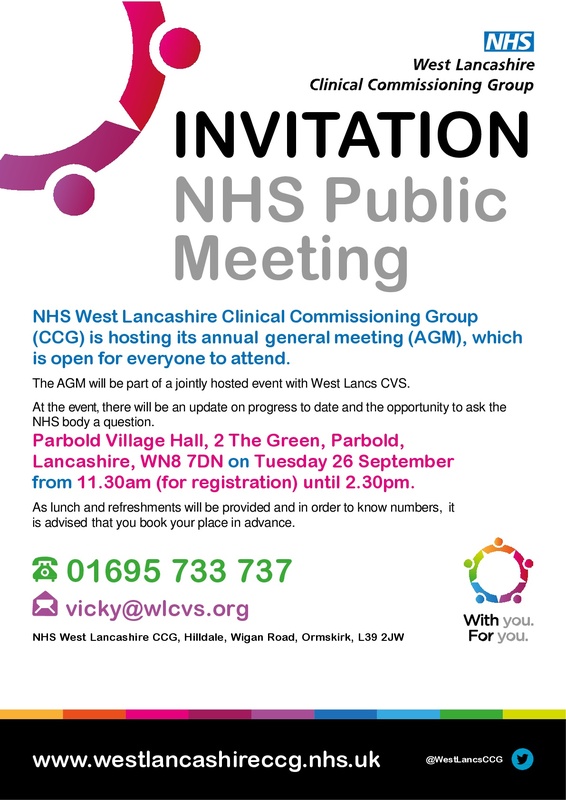 The CCG will take questions on the day and would welcome any submitted in advance by emailing myview@westlancashireccg.nhs.uk or calling 01695 588 203. The CCG’s board meeting will take place at the same venue earlier in the day at 9.30am. Members of the local community are welcome to attend to observe the board meeting. Questions relating to items on the agenda, which is published one week prior to the meeting on the CCG’s website www.westlancashireccg.nhs.uk, can also be raised by contacting 01695 588 144 by noon on Monday 25 September 2017.